What would your dog do if he finds 10 chicks? Most dogs would love to chase them (I know mine would!). But this dog did something different. She acted on her maternal instincts and adopted 10 orphaned baby chicks! 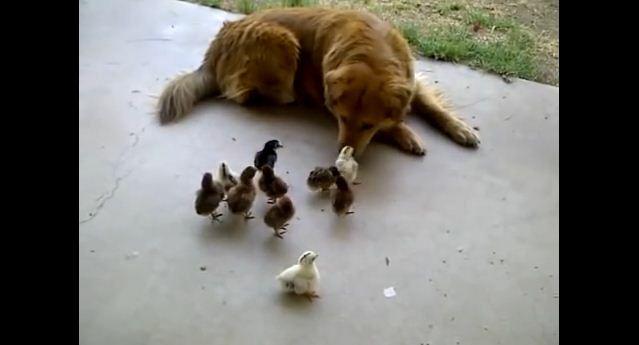 Everyone, meet Bailey, a Retriever mix who found 10 orphaned chicks. The chicks just appeared from nowhere and it seems like they’ve lost their mother. So with no mother to take care of these 10 babies, Bailey steps in and becomes their mother figure. And I gotta say, Bailey is doing quite a good job at it. She’s very friendly, and very gentle! She lets her new babies cuddle in her fur, and she keeps them all warm and toasty! Check out the video below! Aren’t they all adorable? Bailey is doing such a good job, isn’t she? She’s so sweet and gentle with her new babies! I’m looking forward to seeing all these babies grow up and follow Bailey around!